Maurizio Boscheri was born in Mezzolombardo, Italy, in May 1955. 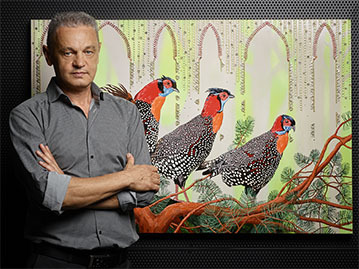 An ardent traveller and nature lover, he began his painting career in 1997. Boscheri is largely self taught and has exhibited his work extensively in Italy, the Torre Branca and Teatro Smeraldo in Milan, the Villa Caldogno in Vicenza, MUSE Museo della Scienza in Trento and the Villa Borghese in Rome. Shows have also been held in numerous international galleries in the United States, Paris, Cairo, Dubai, Shanghai, Colombo and Vienna. His paintings have been exhibited alongside those by Antonio Ligabue, Keith Haring, Francis Bacon and Jean-Michel Folon. Boscheri is frequently asked to exhibit his work in spaces tied to the worlds of science, nature and culture. La Specola Museum in Florence, the International Nature Film Festival in Val D’Aosta, the Polo Museale del Mart di Rovereto Library, the Modern Classical and Contemporary Art Museum Cà la Ghironda and the Artepadova in Padua. In 2011, he was invited to participate in the 54th Venice Biennale, L’Arte Non é Cosa Nostra, curated by Vittorio Sgarbi in Milan and Turin. Boscheri was one of the international artists selected to represent the Transavantguarde chapter of the Animali nell’Arte (Animals in Art) volume, published by Skira with a foreword by Vittorio Sgarbi and critical commentary by Vladek Cwalinsky. In 2012, his work entitled Arcadia, was published in Lo Stato dell’Arte (The Status of Art) by Vitorio Sgarbi with a critique by Georgia Cassini. In addition, he has contributed anthroposophic aquarelles, (anthroposophy is a spriritual philosophy based on the teachings of Rudolf Steiner) to botanical and cultural texts. Boscheri’s work has been auctioned at Sotheby’s in Lisbon, they can be found in numerous private collections, institutions and museums in Italy and abroad. He spends his time between Rovereto, Trento in Italy and Galle in Sri Lanka, where he works in his studio.